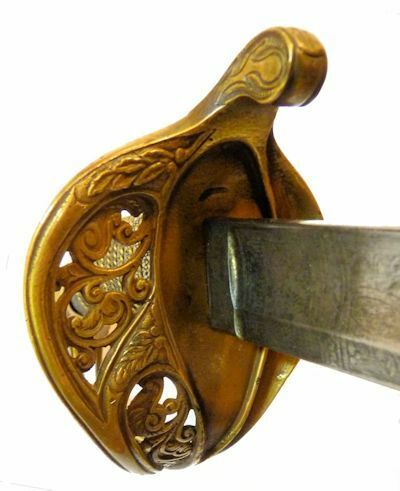 To view our current inventory of fine antique and Civil War swords, click here! This is a rare example of a 19th Century Confederate Navy Flag officer's sword of a pedigreed American maker. It is a very special find. Hilt 5 3/4 inches long. Length overall 37 1/2 inches. In scabbard 38 3/4 inches. Primary Fuller 22 3/4” x 43/64“ Weight sword in scabbard 2 Lbs 13 oz Net 1 lb 14 oz . Presented is a very rare, high quality, M1850 Officer's sword named to Capt F Buchanan USN, later a Confederate admiral, that was made around 1850-51. It has a slightly curved pipe back blade with two fullers, which was common to many Horstmann blades which mainly came from Germany. The two fullers sets the Horstmann swords apart from most others. Naval officers sometimes exercised a wide latitude in specifying much of the specific details of the swords they purchased. That is why there are so many variations. 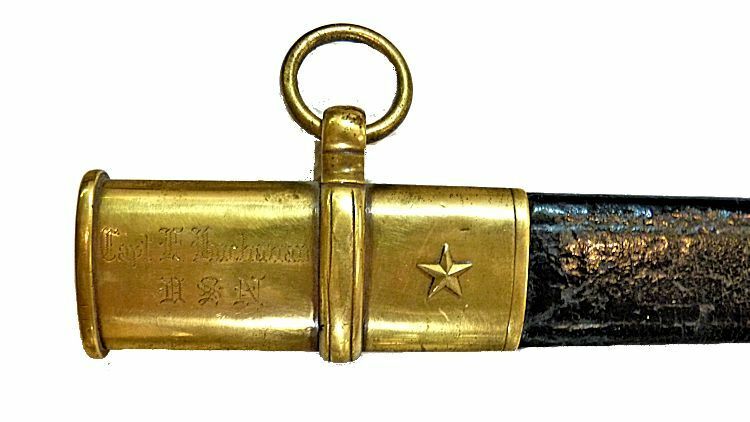 This one is no exception since it is a regulation foot officer's sword carried by a Naval officer who served in both the Union and Confederate Navies and fought in the Battle of Mobile Bay against the Union Admiral, David G. Farragut. The detail of the design on this sword's blade is described below. CAPTAIN, later ADMIRAL, FRANKLIN BUCHANAN was born in Baltimore, Maryland, on 13 September 1800. He became a U.S. Navy Midshipman in 1815, was promoted to Lieutenant in 1825, to Commander in 1841 and to Captain in 1855. Over the four and a half decades of his U.S. Navy service, Buchanan had extensive and worldwide sea duty. 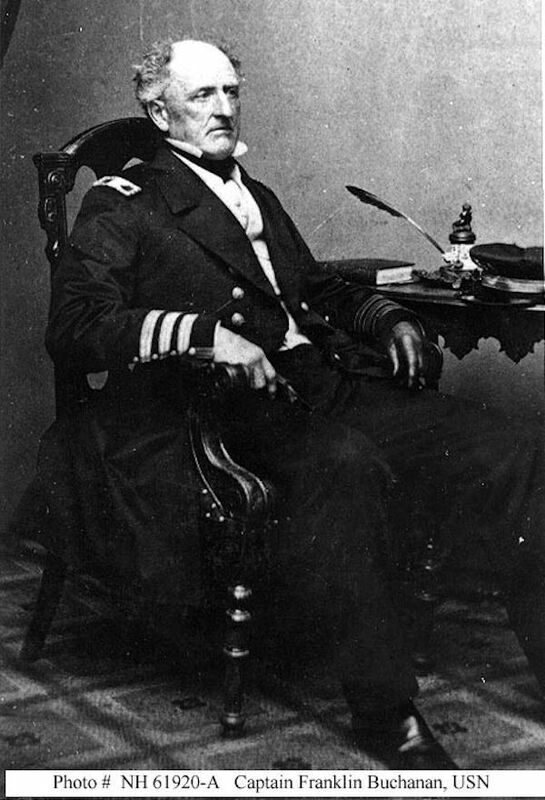 He commanded the sloops of war Vincennes and Germantown during the 1840s and the steam frigate Susquehanna in the Perry expedition to Japan during the 1850s. In 1845-47, he served as the first Superintendent of the U.S. Naval Academy, followed by notable Mexican War service. In 1859-61, Captain Buchanan was the Commandant of the Washington Navy Yard. Believing that his native state would soon leave the Union, Buchanan resigned his commission in April 1861. When Maryland did not secede, he tried to withdraw the resignation. Rebuffed by the Navy Department, which dismissed him from the service in May, he joined the Confederate States Navy, receiving a Captain's commission in September 1861. After heading the CSN's Office of Orders and Detail, Buchanan was placed in command of the defenses of the James River, Virginia. He led the pioneer ironclad Virginia in her successful attack on the Federal warships Cumberland and Congress in Hampton Roads on 8 March 1862, but was wounded in the action and had to leave the ship before her battle with USS Monitor on the following day. Three U.S. Navy destroyers have been named in honor of Admiral Franklin Buchanan, including Buchanan DD-131, Buchanan DD-484and Buchanan DDG-14. The then captain's name is engraved on the throat band, Capt F Buchanan, USN with a Star affixed to the right. THE SWORD: THE BLADE is 31 3/4 inches long by 1 1/8 inches wide and is 1/4 inch thick on the spine which is marked IRON PROOF and elsewhere covered in flora. The primary fuller is 43/64 inch wide and runs 22 3/4 inches over which is a 1/8 inch wide fuller that runs 11 1/2 inches. It is etched over 17 inches of its length. The obverse ricasso is etched W.H. HORSTMANN & SONS. PHILADELPHIA on three lines, all within in a geometric rectangle. This name was used from 1843 to 1863. . Originally, the blade was polished with a frosted design, but the polishing has faded with age. It is now a light even grey with no spotting, with light handling marks, and shallow etching. The cutting edge is unsharpened and without nicks. The leather washer is missing. 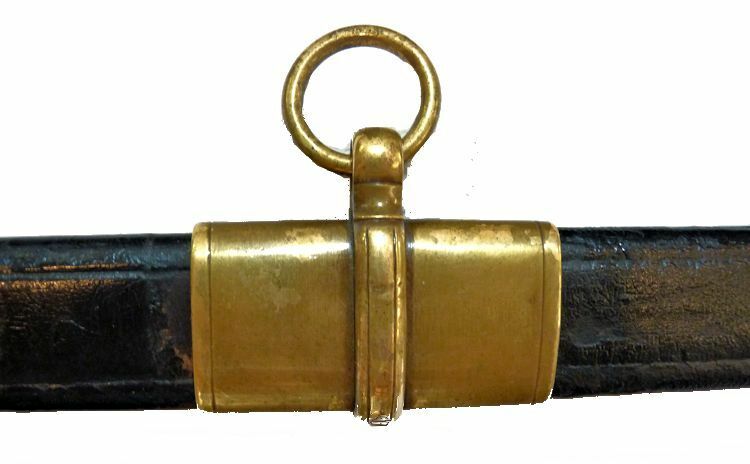 THE SCABBARD: The regulation specified a steel scabbard but most swords of this period for both navy and army, including this one are wrapped in leather, with all their metal consisting of brass mountings, a throat, middle ring, and drag. The grip of the hilt is covered in shagreen and wrapped with two strand copper wire. The scabbard is in excellent condition with only a slight loss of polished leather around the sides of the center carrying band. 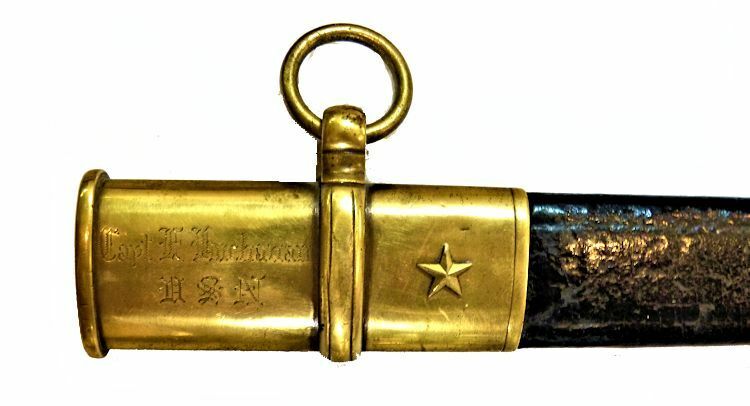 This band has a single star attached which shows the same relative age of the other brass and may represent his Confederate promotion to admiral which occurred on August, 1862. Obverse hilt & blade has Horstmann logo above ricasso followed by various military symbols. IRON PROOF on spine. Right above the Horstmann name on the obverse is a swirl of leaves 4 inches long, culminating in a wreath design within which is an American shield pierced by a bugle, battle axe, crossed swords and pikes. Above that is an spread American eagle with shield on chest. Following this is a floral banner with E. PLURIBUS UNUM followed by 5" of flora and fauna..
On the blade's reverse is a geometric band 5/16 inches long with a series of XXXXX's and double lines. Above that is a 43/64" rising sun at the horizon. Then two kettle drums followed by 6 1/2" of flora and the a large U.S. with a banner further towards the tip. The remaining 5 1/2" is covered in flora and fauna. Considering its age and service, during War Time and possibly the Battle of Mobile Bay, the blade is in very good condition. Close-ups of the scabbard's brass hardware, all of which is in excellent condition. 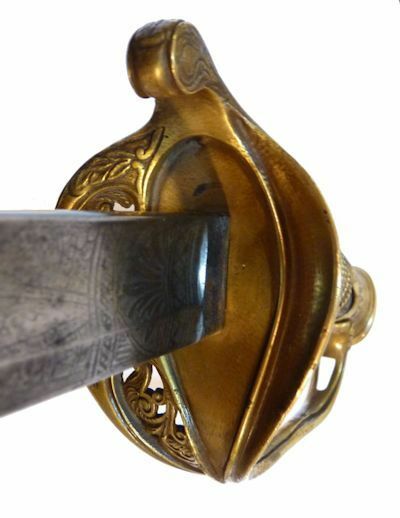 THE HILT: is 5 3/4 inches long ending in an engraved pommel adorned with oak leaves with an end cap showing the tang. The grip is wrapped in white shark skin (shagreen) with fourteen turns of double twisted copper wire. The half basket guard is per the pattern with forward facing quillion flowing into a pierced guard with swirls and curls on the obverse and the same repeated on the reverse. The lower hand guard is slotted for a sword knot or portapee which is added when the sword is worn. None of the gold wash remains. The shark skin wrap is in excellent condition. The left and right side of the front of the admiral's M 1850 guard showing swirls and curls, but no U.S.
* To 5/8 inch in today's military. ACCEPTED FORMS OF PAYMENT are Bank wire transfer, cashier's check, or personal check in which case the item will be held until cleared. Our prices are quoted net to seller, but credit cards may be accepted through PayPal for verified members by special arrangement at an additional charge. Overseas purchases are by bank wire transfer.